I’m still reeling from my EUR/AUD loss so I just decided to take it easy this week and stick with a simpler forex setup. Do you think it counts as a valid breakdown though? Earlier today, the Chinese economy showed signs of a rebound when the HSBC flash manufacturing PMI jumped to its highest level in five months. Although the index fell short of indicating industry expansion, Aussie bulls charged quickly when this news spelled better prospects for Australia’s commodity exports. 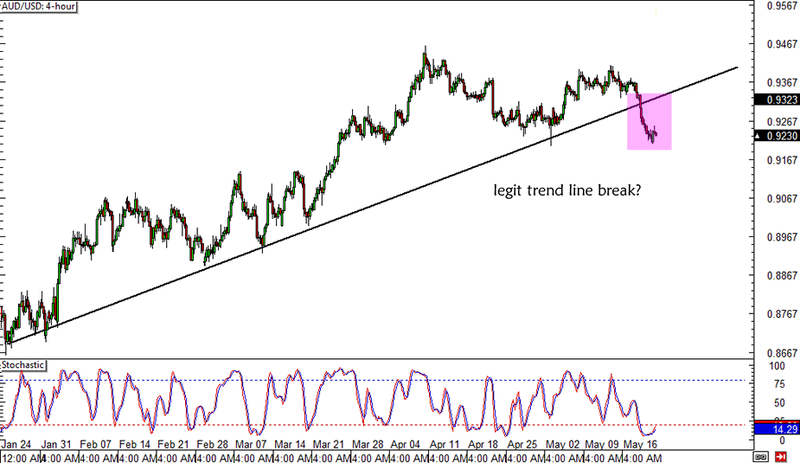 With that, AUD/USD is coming close to testing the broken trend line support, which might now act as resistance. I’m considering shorting on a pullback to the .9300 area but I’m still trying to understand which among the recent fundamental events are just short-term noise and which ones could shape the longer-term trend.